GREECE.- Minister of Culture, Pavlos Geroulanos, speaks to the public during a special ceremony at the Klenia Archaeological Museum of Acient Corinthos, Greece, 17 August 2011. Two Kouros-style marble statues, dating back to 6th century BC.The two statues, named the Kouri (plural) of Tenea , are on display in a specially designed exhibition hall at the museum. 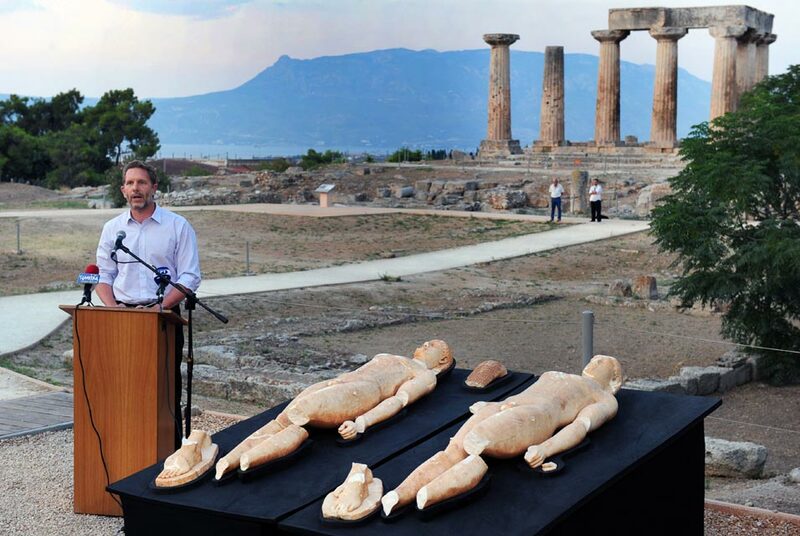 The statues were unearthed during an illegal excavation in Klenies district of southern Corinth prefecture. Police arrested antiquities smugglers in May 2010 and the statues were sent to the National Archaeological Museum in Athens for restoration. EPA/VASSILIS PSOMAS. Story and Photo from Artdaily.org. I have Greece on the brain because I will be there in less than a month! More about my trip soon.